These purple deviled eggs are always a crowd pleaser. They are colored by the reddish-purple from the pickled beets. The pickled beets also add a pleasant tang to the eggs. I normally make my own pickled beets but you can always use a can of pickled beets with some water and vinegar if you are in a rush. For a fun variation you can skip the beets and pickle some red onion with turmeric and the eggs will take on a yellow color. You can soak the eggs in the pickled beet brine for up to 3 days. At 12 hours the eggs take on a small ring of purple and pick up a mild flavor while after 3 days they are fully purple with a strong pickled flavor. This recipe is aiming for some color without an overpowering flavor so it calls for 12 to 18 hours, but feel free to experiment to see what you like best. If you would like more information about the modernist techniques, ingredients, and equipment used in the purple pickled beet and goat cheese recipe you can check out the following. Preheat an oven to 175°C (350°F). Place the beets on aluminum foil, drizzle them with olive oil then salt and pepper them. Wrap the beets in the aluminum foil and cook until they are tender, about 60 to 70 minutes. Remove from the oven and let cool enough to handle. While the beets are cooling make the pickling brine. Combine the apple cider vinegar, brown sugar, and the spices in a pot and bring to a boil, stirring occasionally. Let simmer for 5 minutes then remove from the heat. Remove the skins from the beets. Cut the beets into chunks and add to the cooling pickling brine. Let the brine fully cool then place it in the refrigerator. The brine can be used right away or stored for many days before being used. Peel the hard boiled eggs and place them in the pickling brine. Let them soak for 12 to 18 hours, or up to 3 days depending on the strength of flavor you'd like. Remove the eggs from the brine and finish the instructions for the Basic Deviled Eggs Base. Spoon the yolk mixture from the Basic Deviled Eggs Base into the pickled egg white halves. 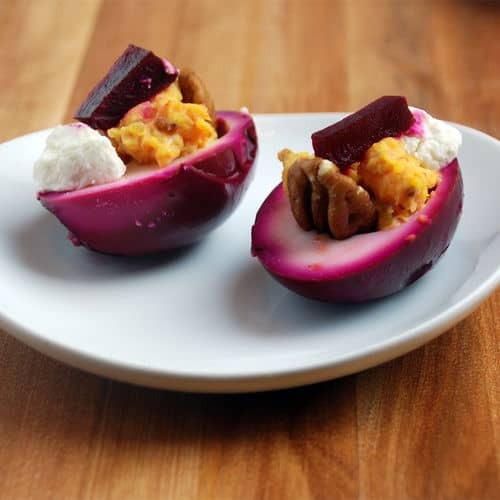 Top with a small scoop of goat cheese, a pecan, and a slice of pickled beet. Sprinkle with thyme then serve. 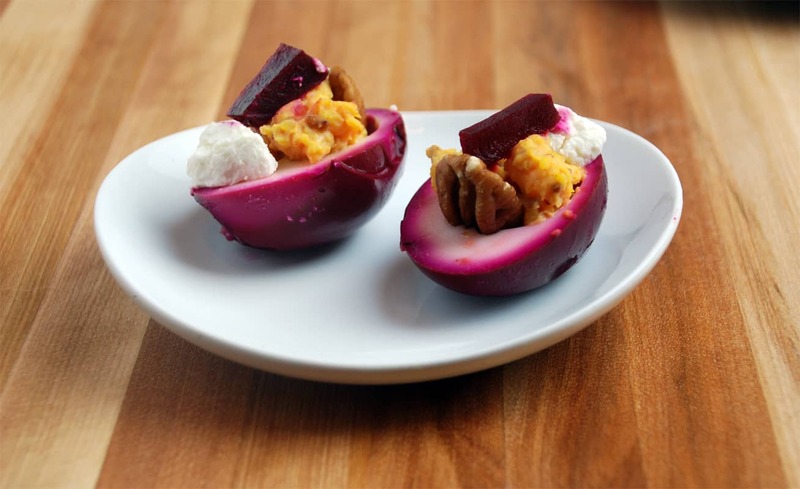 This purple pickled beet and goat cheese deviled egg recipe is always a crowd pleaser! 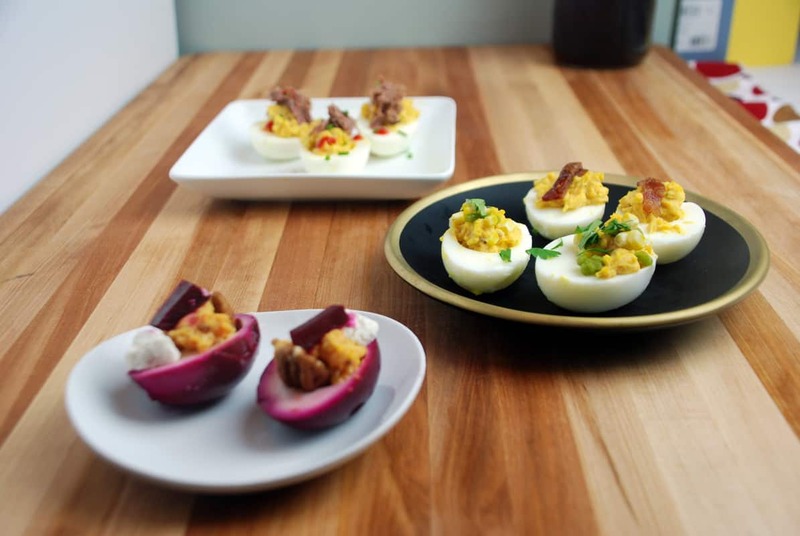 These tangy flavored deviled eggs are topped with a dab of goat cheese, a pecan and a slice of pickled beet.